The Langtang Valley, in northern Nepal, runs east to west inside the Langtang National Park, the first Himalayan national park in Nepal. The national park is also home to the glacier-fed Langtang Khola river, the yak-herding Langtang village and the 23,710-foot tall Langtang Lirung peak. The national park is also home to a number of traditional settlements like Kyanjin Gompa, primarily known for the nearby cheese factory and the Tsergo Ri glacier. • Trek to Langtang Valley besides the gurgling Langtang Khola river. • Catch awesome views of Himalayan peaks like Langtang Lirung and Ganesh Himal. • Visit the local cheese factory and monastery at Kyanjin Gompa. Consumption of alcohol and drugs is prohibited during the trek. Consumption of tobacco products and cigarettes is not recommended either. For cancellations made more than 20 days before departure of the Langtang Valley trek: 70% refund. For cancellations made on or less than 20 days before departure of the Langtang Valley trek: No refund. Land at the Tribhuvan International Airport at Kathmandu. Here, a private vehicle will be waiting to transfer you to a pre-arranged hotel in the city. Spend the rest of the day at leisure. In the evening, you'll meet your trek leader for a short briefing session discussing the weather, itinerary and equipment for the trek. Overnight in a hotel at Kathmandu. Take a guided, sightseeing tour of Kathmandu and visit some of the cultural landmarks and monuments of the capital city. Travelling the narrow roads of Kathmandu, you'll visit local attractions such as the Pashupatinath Temple, the Boudhanath Stupa and the Bhaktapur Durbar Square. You can also stop by the local marketplace to do any last minute shopping and wind up preparations for the trek. Overnight in a hotel at Kathmandu. 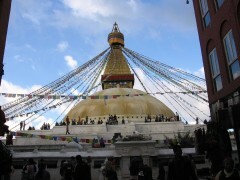 The Boudhanath Stupa, one of the cultural attractions in Kathmandu. Board a state transport bus from the Kathmandu bus station and travel to the small town of Syabru Besi. This 8-hr, scenic journey will take you out of the city and into the mountains. First views of snow-capped peaks like the Ganesh Himal make up for the rough and bumpy highway roads. Overnight in a guesthouse at Syabru Besi. Entering the village of Syabru Besi on a narrow mountainous road. Begin trekking from Syabru Besi along the gushing waters of the Langtang Khola river. The route turns across mountain slopes and gradually ascends towards Lama Hotel. En route, you'll pass tiny villages of Bamboo and Rimche, where red pandas and monkeys swing from tall branches of the surrounding forest. Overnight in a guesthouse at Lama Hotel. 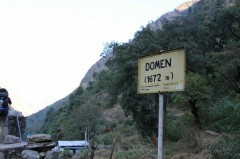 A sign post at the entrance to the village of Lama Hotel. Continue trekking over the gradually ascending route towards today's destination of Langtang. One of the oldest settlements in the valley, the Langtang village is home to several yaks that are often seen meandering about. The snow-swept mountains on the horizon begin getting closer and closer as you travel deeper into the Langtang valley. Overnight in a guesthouse at Langtang. 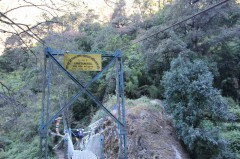 A bridge over the Langtang Khola river, just before entering the Langtang village. 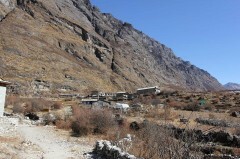 Trek to Kyanjin Gompa, located just a short distance away from Langtang. The village is famous for housing a cheese factory that is open to visitors and travellers, offering freshly produced cheese to taste. 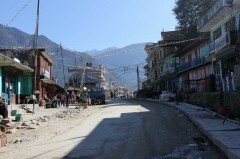 The village is surrounded by small hillocks and peaks, overshadowed by the towering Langtang Lirung. Overnight in a guesthouse at Kyanjin Gompa. The village of Kyanjin Gompa, overlooking massive Himalayan mountains. Spend the day at leisure in Kyanjin Gompa. You can visit the local monastery or the nearby cheese factory. You can also hike up the glaciers of the Langtang Lirung or ascend the Kyanjin Ri peak. Alternatively, you can also relax and revel in views of gigantic peaks from Kyanjin Gompa. Overnight in a guesthouse at Kyanjin Gompa. Take short day hikes from the village of Kyanjin Gompa. Retrace your ste+B17ps on the trail until you arrive at Lama Hotel. The descending route will follow the banks of the Langtang Khola river and pass through the villages of Langtang and Thangsyap. Overnight in a guesthouse at Lama Hotel. 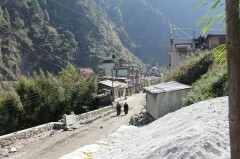 The narrow trail leading up to the Langtang village. Leaving the mountain valley behind, you'll trek back to Syabru Besi to conclude the Langtang Valley trek. You'll take the same route, previously taken while ascending, and arrive at Syabru Besi after about 5 hrs of trekking. Overnight in a guesthouse at Syabru Besi. Lodges and hotels in the village of Thangsyap, on the way back to Syabru Besi. Board a state transport bus from the Syabru Besi bus station and travel to the city lights of Kathmandu. Bid goodbye to the mountains as you descend from mountainous terrain to flatlands. The 8-hr journey will conclude at Kathmandu by evening. Overnight in a hotel at Kathmandu. Spend the day at leisure in Kathmandu. You can visit the local marketplace to shop for souvenirs and gifts, or rest in your hotel. In the evening, you'll head out to a popular restaurant in Kathmandu for an authentic Nepalese dinner, accompanied by cultural music and ethnic dance. Overnight in a hotel at Kathmandu. Check out of the hotel and transfer to the airport in a private vehicle. Your trip ends here. Land at the Tribhuvan International Airport and meet your trek leader for a short briefing session. You'll be accommodated in a three-star hotel at Kathmandu with standard rooms on twin-sharing basis. No meals are included in today's package. You may visit any of the restaurants in Kathmandu to have meals at your own expense. 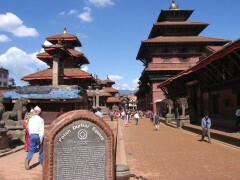 Travel in a private, tourist vehicle and take a heritage, sightseeing tour of important monuments in Kathmandu. An English-speaking, licensed guide will accompany you throughout the tour. You'll be accommodated in the same hotel as yesterday. Today's meal package includes breakfast only. You may visit any of the restaurants in Kathmandu to have meals at your own expense. Travel in a state transport bus from Kathmandu to Syabru Besi. You'll be accommodated in a guesthouse at Syabru Besi on twin-sharing basis. If unavailable, accommodation may be changed to dormitory-style rooms on multi-sharing basis. Today's meal package includes breakfast, lunch and dinner. 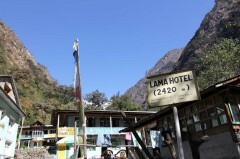 Trek alongside the Langtang Khola river from Syabru Besi to Lama Hotel. You'll be accommodated in a guesthouse at Lama Hotel on twin-sharing basis. If unavailable, accommodation may be changed to dormitory-style rooms on multi-sharing basis. Today's meal package includes breakfast, lunch and dinner. 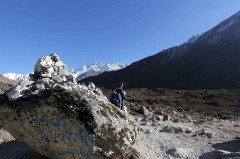 Hike up the gradually ascending route to the small and ancient village of Langtang. You'll be accommodated in a guesthouse at Langtang on twin-sharing basis. If unavailable, accommodation may be changed to dormitory-style rooms on multi-sharing basis. Today's meal package includes breakfast, lunch and dinner. Travel further into the Langtang Valley on a short trek to Kyanjin Gompa. You'll be accommodated in a guesthouse at Kyanjin Gompa on twin-sharing basis. If unavailable, accommodation may be changed to dormitory-style rooms on multi-sharing basis. Today's meal package includes breakfast, lunch and dinner. Spend the day at leisure in Kyanjin Gompa and take short hikes around the village. You'll be accommodated in the same guesthouse at Kyanjin Gompa. Today's meal package includes breakfast, lunch and dinner. Begin the return trek and descend to Lama Hotel. You'll be accommodated in a guesthouse at Lama Hotel on twin-sharing basis. If unavailable, accommodation may be changed to dormitory-style rooms on multi-sharing basis. Today's meal package includes breakfast, lunch and dinner. Conclude the Langtang Valley trek by returning to Syabru Besi. You'll be accommodated in a guesthouse at Syabru Besi on twin-sharing basis. If unavailable, accommodation may be changed to dormitory-style rooms on multi-sharing basis. Today's meal package includes breakfast, lunch and dinner. Travel in a state transport bus from Syabru Besi to Kathmandu. You'll be accommodated in a three-star hotel at Kathmandu with standard rooms on twin-sharing basis. Today's meal package includes breakfast only. You may visit any of the restaurants in Kathmandu to have meals at your own expense. Spend the day at leisure in Kathmandu. You'll be accommodated in the same hotel in Kathmandu. Today's meal package includes breakfast and dinner only. You may visit any of the restaurants in Kathmandu to have meals at your own expense. Transfer to the airport and head to your next destination. Today's meal package includes breakfast only. Your trip ends here.